Although my last day at the High Point spring home furnishings market was Saturday, I’m just now getting around to uploading all of my pictures, and downloading my readers on all of the amazing things I saw and did there. I am planning a few posts around different design trends I picked up on – and this first one is very near and dear to my heart. I’m loving the new (and some not-so-new) breed of home decor that is derived from very traditional designs and forms, but transformed into totally relevant, fresh products that breathe new life into interiors in a variety of styles. 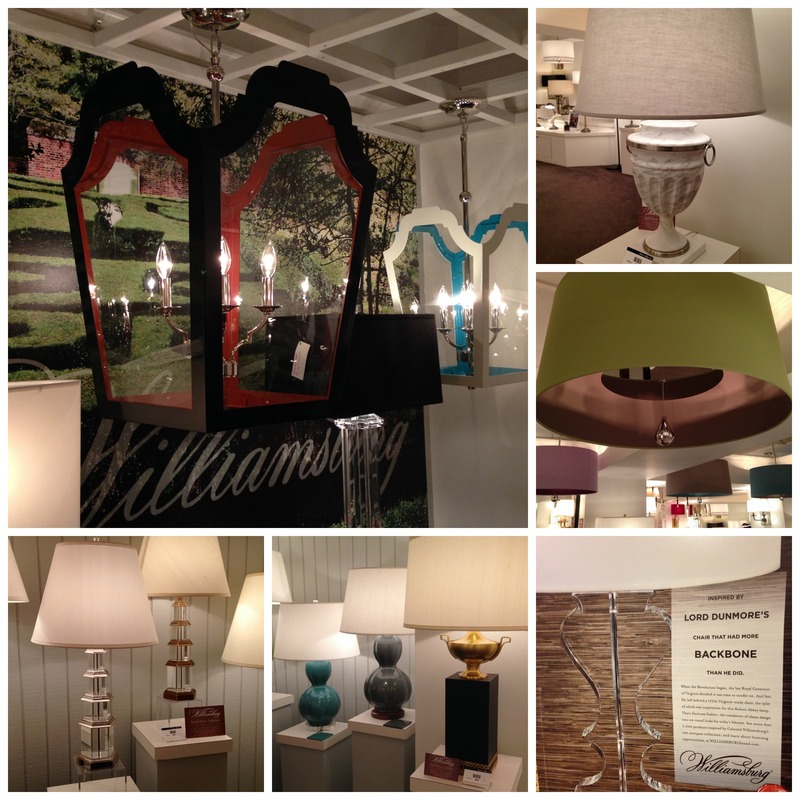 Here are a few of my favorite “classically inspired” finds. The Greek key motif is still going strong, and appearing in all sorts of guises and products. 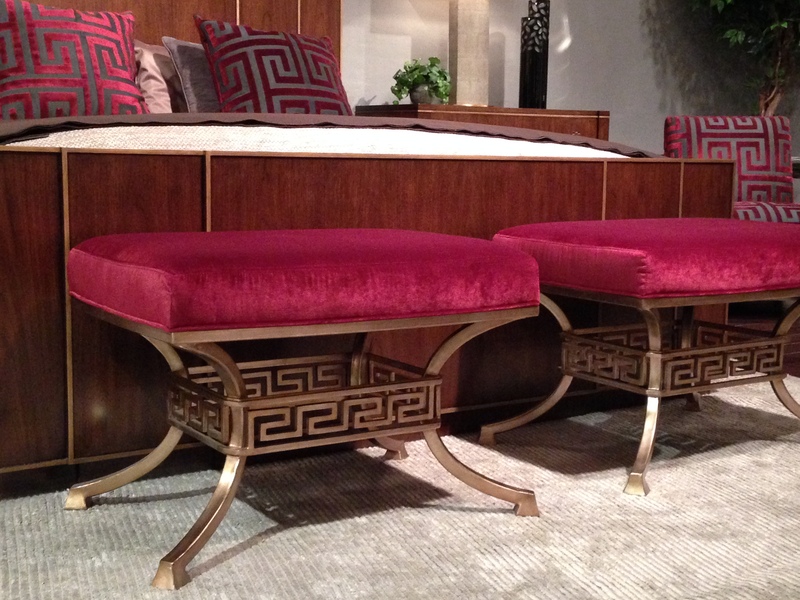 These pink velvet and gold klismos-esque benches were all transitional glam at Lexington Home Brands (and hyper-coordinated with the figured velvet pillows on the bed). 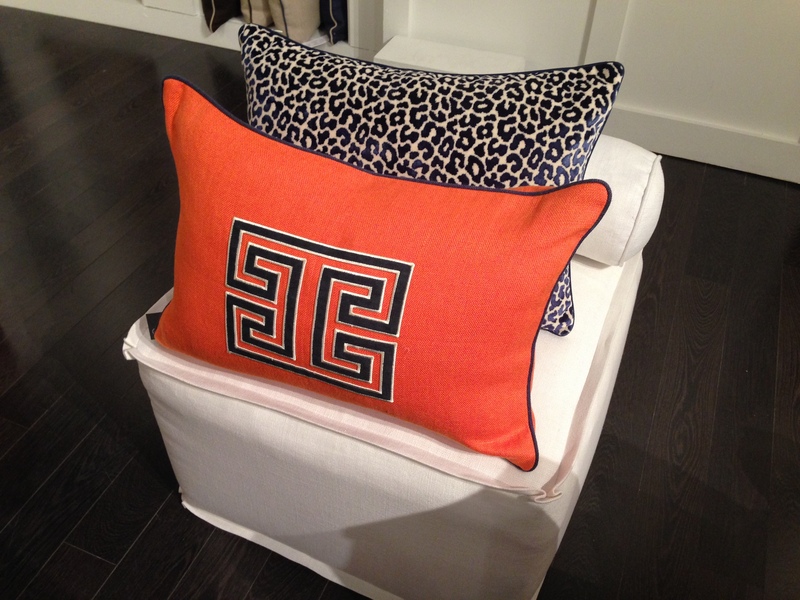 Pillow purveyor Ryan Studio featured this bold lumbar featuring a bright orange solid, narrow navy welt, and a fretwork appliqué from Mary McDonald’s eponymous collection for Schumacher. 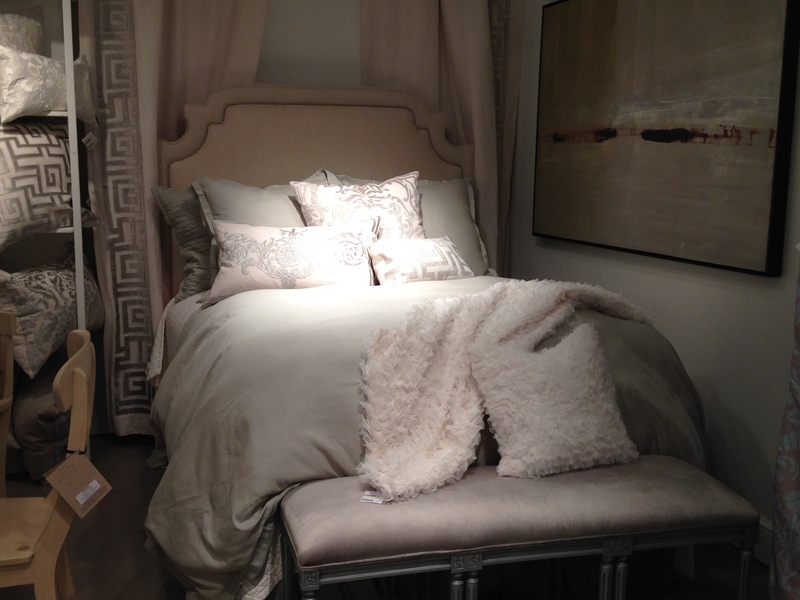 Luxurious textures and a soft, restful palette summarize the Lili Alessandra collection, featured in the CODARUS showroom. We were all ogling over this bedroom vignette in a subtle sea foam green, and especially the wonderful draperies (lined and interlined, by the way – fully couture) with a wide, large-scale cut velvet fretwork border on each leading edge. 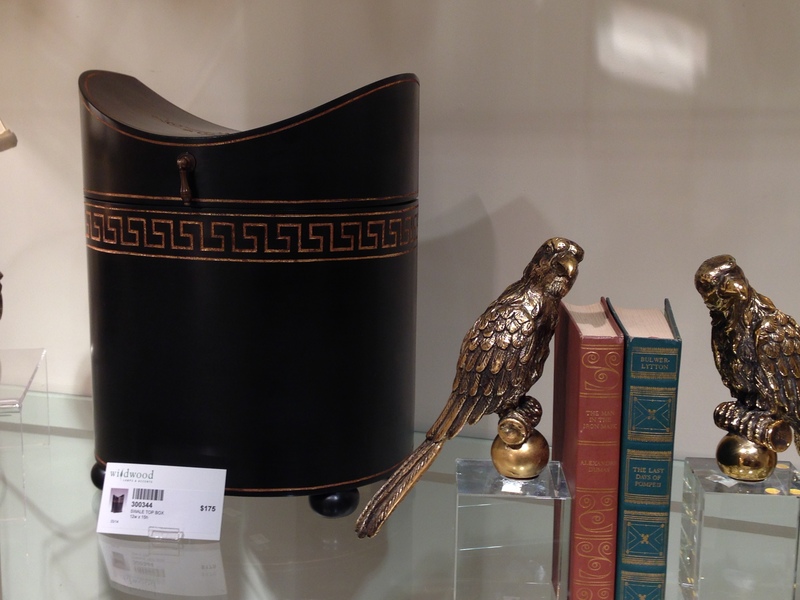 This antique-looking decorative box from Wildwood Lamps would be a great addition to a deep mantle shelf or dining room sideboard. Also at Wildwood, these substantial glass hurricanes featured an etched Greek key band – and have my name written all over them, too. 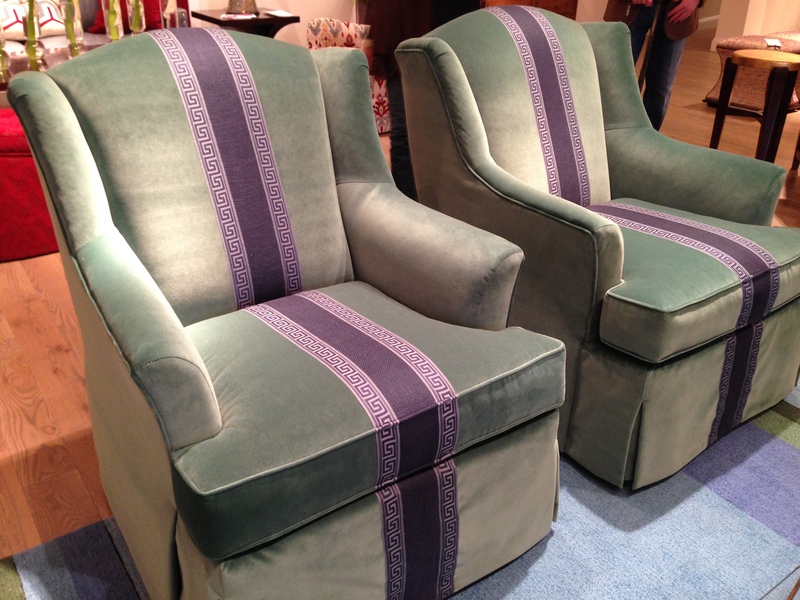 These much-Instagrammed skirted chairs at Wesley Hall were decked out in lustrous green velvet, and embellished with a bold stripe of royal purple trimmed with a coordinating Greek key braid trim. Don’t they just ooze glamour? New River Artisans produced the impactful area rug in this, one of my favorite vignettes at market (also at Wesley Hall). The classic octagonal honeycomb pattern is surrounded by a large-scale Greek key border. The strong geometry and scale of the rug was the perfect foil for the fabulous dragon wallpaper (illustrating yet another prominent trend: Asian-inspired textiles and furnishings). 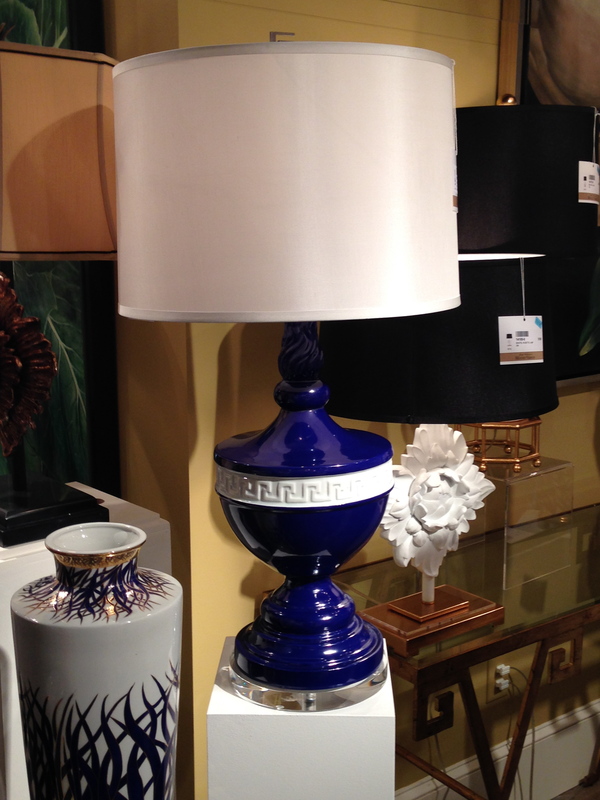 The classical urn form of this royal blue ceramic Wildwood lamp is contemporized by its straight-lined drum shade and clear acrylic base and finial. 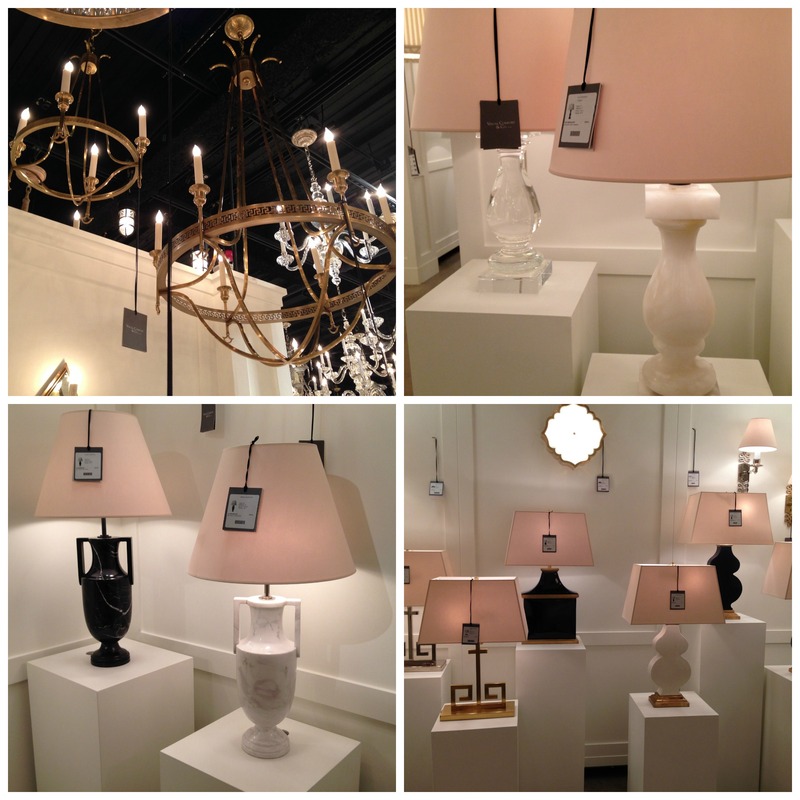 Beyond our enduring friend, the Greek key motif, I fell hard for classically-inspired lighting at some of my favorite vendors’ showrooms. 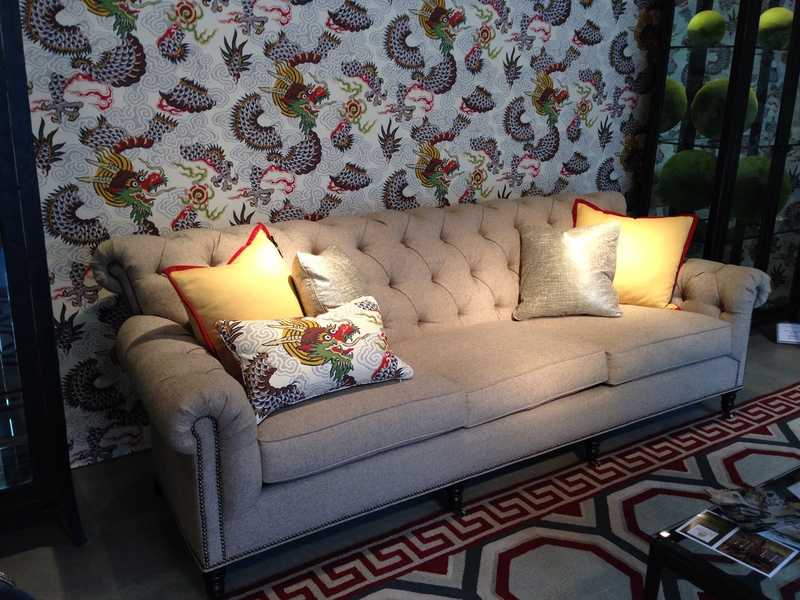 Robert Abbey debuted its licensed collection with Williamsburg, and I personally think it is going to be a HUGE hit. The designs are totally modern, yet directly inspired by predecessors from the history of American interiors. Benjamin Moore’s Williamsburg historic color collection is also utilized to great effect here, providing wonderful opportunity for customization and color coordination. Many of these designs from Visual Comfort are not brand new, but they not only demonstrate the resurgence of classical design, but also a “sub-trend” within this category, which was the popularity of both marble and alabaster as primary materials. 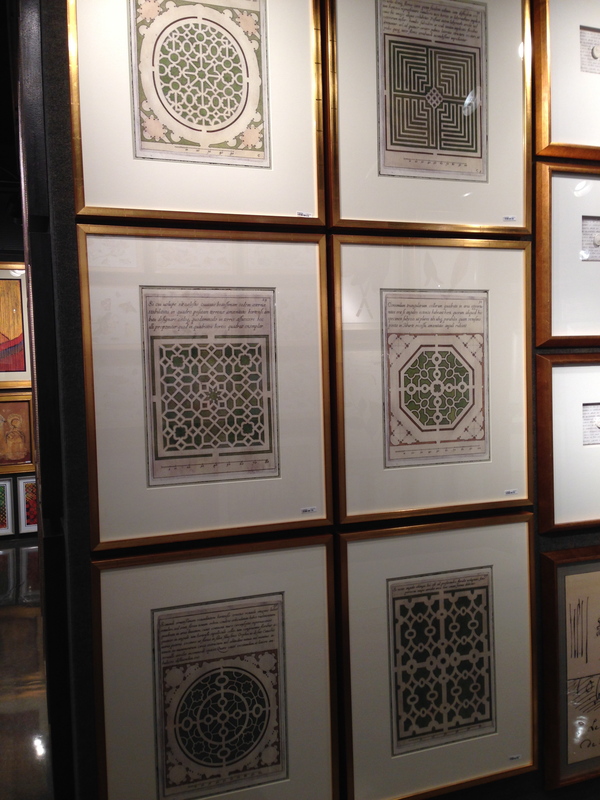 Old engravings of French neoclassical garden plans have become recently popular, and are inspiring a whole host of products that creatively exploit their hyper-symmetry and complex geometry. In the most literal sense, the French garden plan appears in the form of fine art prints that read as contemporary patterns on your wall. These versions from Soicher-Marin are a personal favorite of mine – they were featured at market in what I believe is a new green hue. 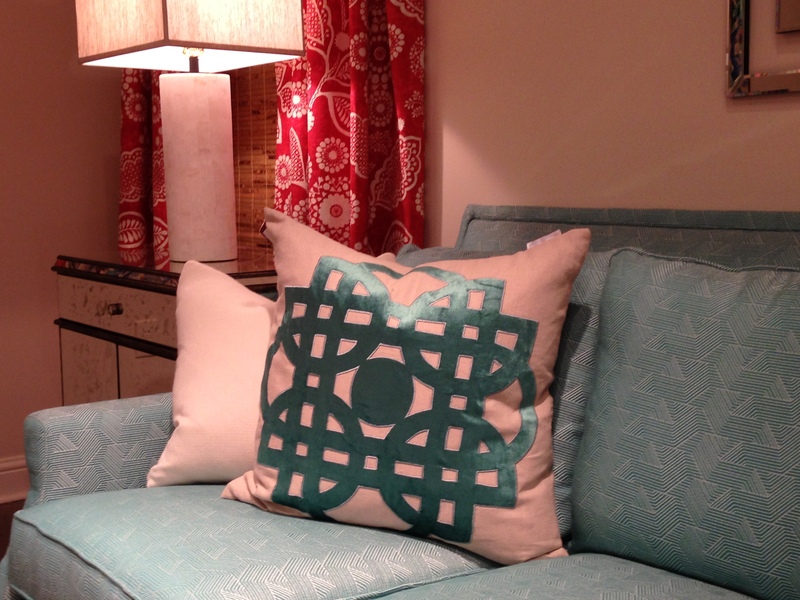 CR Laine featured Traci Zeller’s brand new line of throw pillows, which were inspired by the French garden plan. I was delighted to meet Traci at her launch party – she is another family-friendly design practitioner (and just a fabulous designer and blogger, smart entrepreneur and sweet person, in general). So what’s family-friendly about this gorgeous, luxurious pillow, you might ask? They are well-priced – making them an affordable luxury that you don’t mind “someone actually putting their head on,” as she put it. I was also stopped in my tracks by this artwork vendor that is new to me – Chicago-based Mitchell Black. 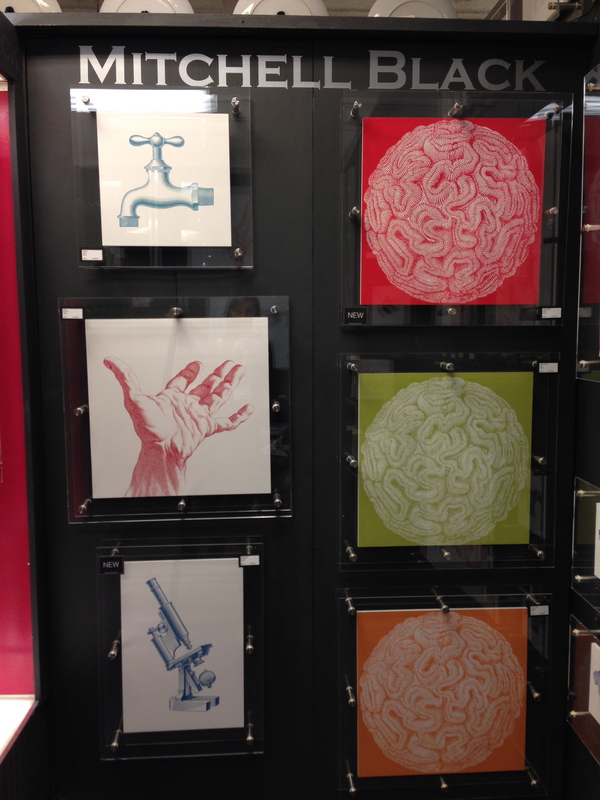 Their showroom featured these great prints that are recolored, isolated interpretations of actual engravings from old advertising, fine art, etc. 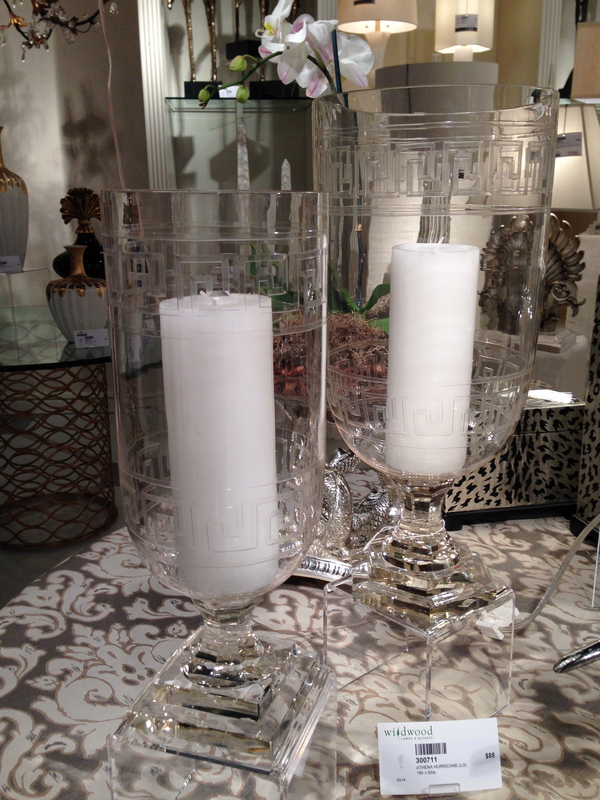 What do you think of the Classically-Inspired design trend?